This Housing Symposium will explore and build the synergy between business growth and diverse housing options. Speakers will address the challenge businesses face with a significant gap between housing costs and wages, and present working models for housing solutions. This is a networking event designed to foster collaboration and highlight best practices. 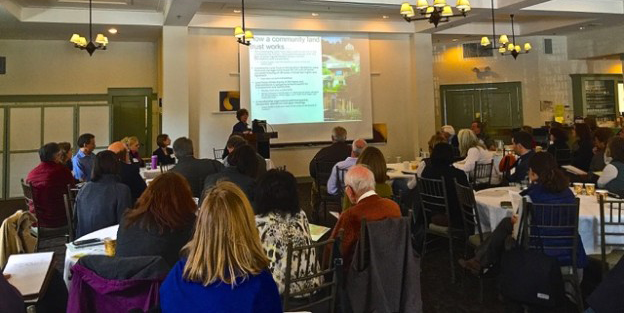 The Housing Symposium takes place Tuesday, March 31st, 9:00 am to 2:30 pm at Crissey Farm in Great Barrington, MA. Tickets are $35 and include breakfast and lunch. Advance registration is required. This symposium is for business leaders, policymakers, town planners and other community partners to examine how affordable housing can boost economic development in the region. The day’s program will open with David Rich, Chair of the Board of HousingUS and Executive Director of Supportive Housing Works in Fairfield County, CT, introducing the housing/jobs conundrum, and the desire of businesses to retain top quality employees in an environment of steady economic growth. Patricia Mullins, Senior Planner/Project Manager at Berkshire Regional Planning Commission, will moderate a discussion of business leaders including Chris Brooks, General Manager, White Hart Inn & Tavern; Jonathan Butler, Vice President/COO, 1Berkshire and President/CEO, Berkshire Chamber of Commerce; Michael Harney, Vice President, Harney & Sons Fine Teas; Jennifer Tabakin, Town Manager of Great Barrington. Rikki SaNoqueira, Associate Project Manager at CDC of South Berkshire, will moderate a discussion of best practices for affordable housing custom-tailored to our rural towns and villages, including panelists Billie Best from Community Land Trust in the Southern Berkshires; Elizabeth Druback-Celaya, Director of Organizational Development, Hudson River Housing; June Wolfe, Property Manager, Construct; Tim Geller, CDC of South Berkshire; Anne Hughes, HousingUs Program Director at Berkshire Taconic Community Foundation; and Carolyn Valli, Executive Director, Central Berkshire Habitat for Humanity. The lunch presentation will be delivered by Philippe Jordi, Executive Director, developer and manager of Island Housing Trust on Martha’s Vineyard, where their resort community has been successful in fundraising, building affordable homes and addressing many of the same economic development issues we confront here in the Tri-Corner region. The afternoon will conclude with networking and an open discussion of slow money impact investing and philanthropy for economic development. The symposium is presented by Berkshire Taconic Community Foundation HousingUs Program, Berkshire Regional Planning Commission, Community Development Corporation of South Berkshires and Community Land Trust in the Southern Berkshires. The Tri-Corner Region includes Southern Berkshire County, Northwestern Connecticut, Northeast Dutchess and Columbia counties in NY. For more information on the event contact Anne Hughes, HousingUs Program Director at Berkshire Taconic Community Foundation, 413.229.0370 x 105 or email her at ahughes@housingus.org.